It’s no secret we are in an era of steady technological change. This combined with a growing need to conduct our work in the absence of the traditional office setting is bringing new challenges to how teams work together. Fred Wellman discusses strategies to assist distributed teams be more effective. Regardless if you are a global company or working in the confines of a single region, geographically distributed teams are the new norm in the engineering and construction industry. 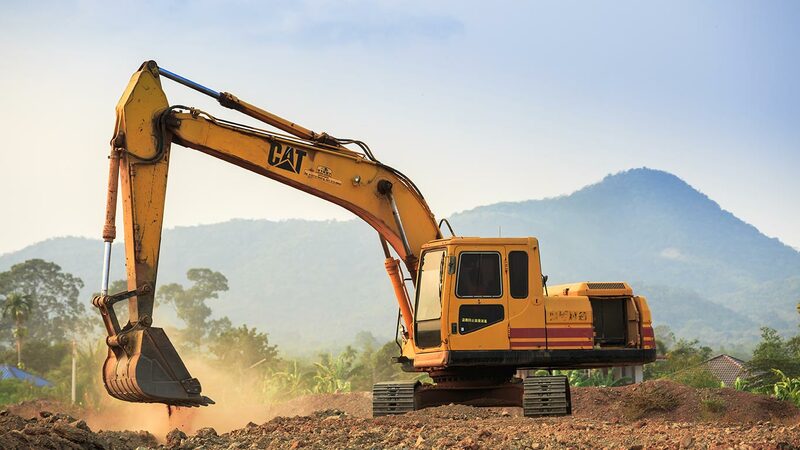 Projects are now global in nature with companies coping with trends to secure services from lower cost, offshore service providers and the global scope of projects driven by increased size and complexity is now requiring resources to be coordinated from multiple countries to get work done. In a business environment where fewer and fewer teams can co-locate or hold face-to-face meetings, the industry must adapt to the onset of distributed teamwork. Like it or not, virtual teams are a norm and collaborative technology is often encouraged if not required by today’s business leaders. But surrounding the use of technology, there are other factors to consider when thinking of how distributed teams can work well together. Common barriers to the success of distributed teams include: lack of methods and best practices geared to working in virtual environments, inadequate hardware, limited secure bandwidth, poor software interoperability, time differences, inadequate trust, tepid participation of team members, cultural and language challenges, and absence of social cues typically available in more interpersonal settings. As organizations shift to a new paradigm away from a collocated workforce, more focus is needed on the core elements of the team, new and improved work methods geared to virtual teams and use of collaborative technology. 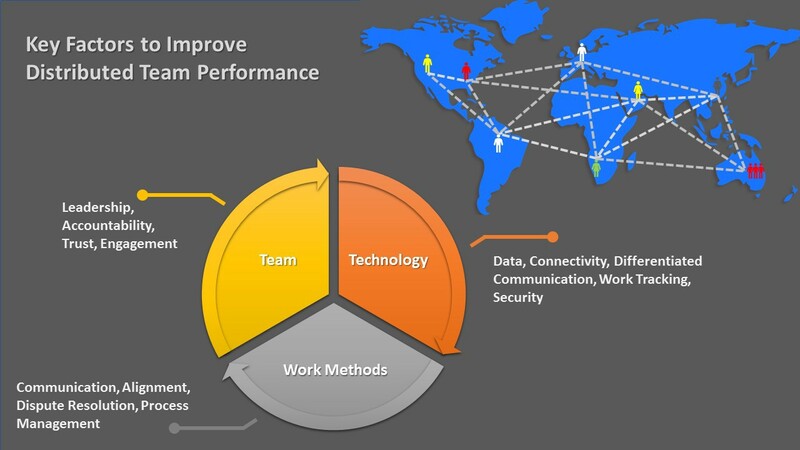 Team leadership is a fundamental ingredient in improving performance of distributed teams. Effective virtual teams must possess leaders that establish, connect, and align team members around specific project tasks, completion of important milestones and maintaining the quality of deliverables. Leaders must keep their teams focused with their consistent involvement in activities and supplement team constituents and resources when needed. Accountability of team members is also an important factor in team composition followed by dependable engagement and trust among team members. All must be nurtured by leaders of distributed teams. Because these elements are more of a challenge in a virtual setting, having solid methods of engagement and practices in place, is fundamental to compensate for the lack of traditional relationships in co-located workers. Additionally, methods centered around meeting standards, frequency of meetings, dispute resolution, communication standards and team member alignment are all key process considerations for distributed teams. Regardless of which technology is enabled, team communication is significant to sustaining virtual team members. Team leaders and team members must be diligent to ensure communication is open, clear and concise in a virtual setting. Think of parsing through the endless stream of those multi-threaded, disjointed emails with cryptic and unclear actions every day and you know what I am talking about. Teams require carefully organized assignments or tasks to achieve their objectives. Therefore, the presence of a dispute management process is important to ensure a clear understanding of individual expectations for independent work is maintained around well-defined expectations and assurance of team member accountability. Clearly, technology is a fundamental factor in virtual team success and satisfaction. Not surprisingly, connectivity and secure bandwidth predominate, followed by differentiated communication supported by collaborative software such as video, texting, chatting, speech and desktop sharing. Data interoperability and work tracking are also ingredients in the technology space supporting distributed teams. Distributed teams are now common place but the success and satisfaction of working within them is somewhat illusive. To combat the challenges of working virtually, team composition, leadership and methods of executing work specifically geared to distributed teams are important to the effective use of technology that binds us together in today’s workplace. Leaders and team members must learn and embrace new skills and adopt differentiated processes to enable team success. Adopting these success factors will enable team members to thrive and contribute better in distributed teams. Subscribe to the famous boots > suits blog to get the latest content and Sitemate news first.